weeks. This is because its now taken down and our specialists say that the front end power transistors kena lightning. we have to organise repairs the way we see fit. Will update Berita ni when available. The class will be held at No 3 D, Jalan PJS 1/48 (Previously Jalan Petaling Utama 7) Batu 7 Jalan Kelang Lama, Petaling Utama, Petaling Jaya. (next to England Optical Group). Time will be from 10.00 a.m. till 4.00 p.m.
Limited seats are available as the class can accommodate 20 pax only. 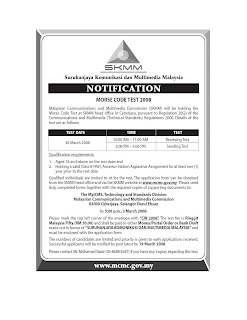 Fee: RM20.00 to cover the cost of materials and some charges incurred for the classroom. If you want to attend drop an e mail to me at aiznin@gmail.com or go to http://martsmanager.blogspot.com/ for more information. Remember 20th of June 2008 2100H at Anis Putri 2. That is the date for the election of the State Liaison Manager for Selangor (including Putrajaya and Kuala Lumpur). Nominations form will be made available from Tuesday next week at this site. 9M2CJ, the VHF service on Bukit Lanjan is now back to being operational. This is due to MARTS loaning us a Motorola mobile repeater, while they take the trouble to repair the old Kenwood set in Penang. 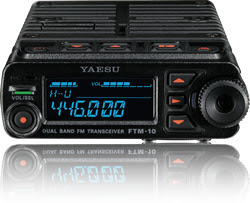 The exciting newly designed FTM-10R/E* Mobile 2m/70cm Transceiver is packed with innovative features that operators have been dreaming of for years. Great new appearance with keys and indicators that are illuminated with very bright LEDs. The bright ocean blue negative type LCD display is easy on your eyes. Super compact detachable front panel is ready to go with your motor vehicle! The unique Waterproof/Dustproof Front Operation Panel is designed to support All-Weather Outdoor Activity in a manner never before possible. Detach the front panel with one-touch release when transmitting! The detachable front panel may be separated from the main chassis, and attached to a flat metal surface with the magnetic mounting bracket. The microphone and PTT button are built into the front panel. This front panel meets the IP57 standard - waterproof at 3 ft (1 m) for 30 minutes and protection against dust – making the FTM-10R/E* the perfect outdoor communications and entertainment package. NB: Use of a communication device with a display while driving may be prohibited in some states and some countries. brought down from its perch at Bukit Lanjan today for checking. Will readvise when it has been reinstalled and back to normal. available for use, not including the national link.